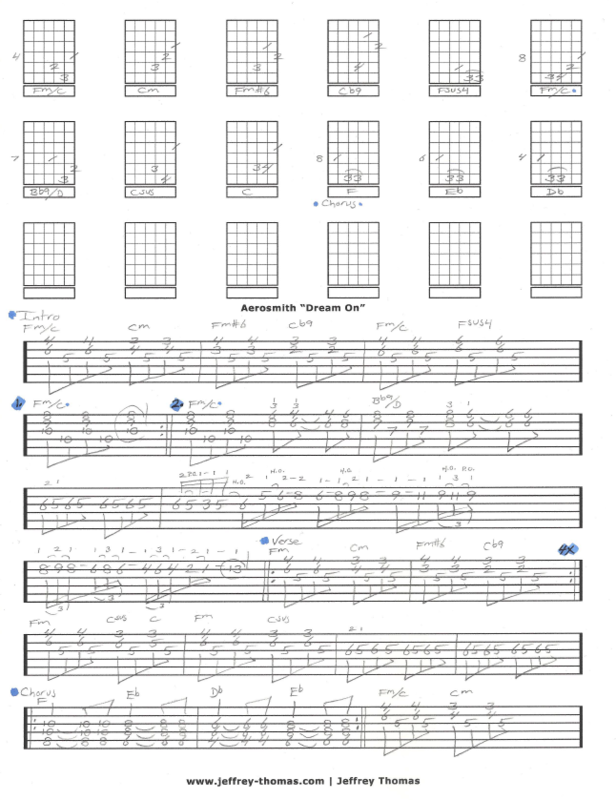 Learn to play “Dream On” by Aerosmith with my free rock guitar tab. This tab shows you all the signature licks and song structure arranged for one guitar. Learn to play the intro, verse, chorus all five pentatonic patterns for F minor with all the classic Joe Perry fills notated. Dream On a very popular request from my rock guitar students. Want the full guitar tab for free? Just send me your email address using the form provided and I’ll send it to you. Need help learning to play this song? Fill out the Schedule A Free Lesson form to set up a free Skype guitar lesson today. I hope you enjoyed my Dream On guitar tab by Aerosmith. Make sure to check out more online guitar lessons on my tab, video and blog pages.